Brett Murray’s explicit painting of President Jacob Zuma has found an unlikely admirer in Tselane Tambo, daughter of the late Oliver Tambo – one of the ANC’s illustrious leaders. Tselane’s tweet elicited immediate reaction on the social network sites. “Ouch! I think that’s harsh… The two things (service delivery and the painting) are not related but I guess I expected too much from the daughter of the freedom fighter,” said Olwethu Dante Mngambi on Facebook. Some said the criticism of the portrait was hypocritical. “I was thinking if the Pres, sons and daughters are so noisy about the portrait, why are they quiet about their brother and cousins for failing to pay poor people at their mining operations?” said one tweet. The Spear, which has been criticised by the ANC, has been bought by a German private collector for R136 000. In his affidavit for an urgent application to be heard in the Johannesburg High Court on Tuesday, Zuma says the continued display of the painting is a violation of his right to dignity and makes a mockery of his office. 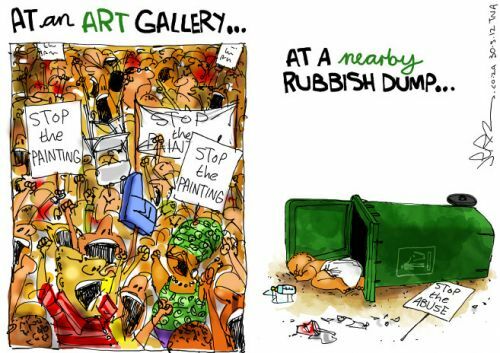 The president and the ANC’s legal representatives asked the Goodman Gallery and City Press to remove the portrait and images, but both parties have refused.